How easy it is to focus on what a teacher should do to be effective. But, even what we do needs to grow out of who we are ... what's in our heart. The tasks within the teacher's role require certain heart qualities if they are going to be accomplished most effectively. Task: An effective Bible teacher verbally informs students of what God's Word says in ways that hold interest, fit their age level, accurately represent God's intent, and encourage students to do something with what they learn. Task: Effective teaching helps students know, love, follow and serve Jesus and become more like Him in all they say and do. 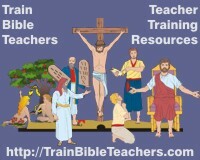 A Bible teacher trains and equips. Task: Effectiveness in teaching is about more than maintaining order in the classroom. Problems and misbehavior are viewed as learning opportunities to teach students to become who God desires them to be. This requires getting to the root of problems and helping students learn how to rise above. Task: An effective teacher comes alongside of students, personally relating with them, caring about them as individuals, taking steps to get to know one another. Task: To effectively teach, teachers must facilitate learning in a way that enables students to discover truth through varied learning activities planned by the teacher that encourage participation and involvement. Task: To effectively teach, Bible teachers must connect with students in ways that spur them on toward belief and application of God's Word. A Bible teacher models Christ-likeness. Task: An effective Bible teacher not only tells students what they need to know but also demonstrates it by their own lives through actions, words, and attitudes both in and outside of the classroom. Task: An effective Bible teacher demonstrates servanthood by a willingness to sacrifice their own time and effort for their students but also exhibits it in their attitudes, not just their actions. Being Versus Doing: Which is most important in ministry?